Swiss folk metal masters Eluveitie will release their new full-length album “Ategnatos” on April 5th 2019, via Nuclear Blast. A work based on archaic archetypes and the ancient concept of renewal, “Ategnatos” unfolds an elemental force to be reckoned with. And by using their longest gap between two metal albums to gather momentum, they just forged their strongest album around it. No wonder the album follows a decidedly darker, monumental tone that suits them very well. 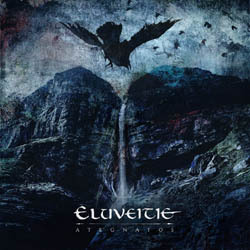 Of course, Eluveitie have long found their very own trademark sound, a sonic adventure often copied, but never overcome. With “Ategnatos“, the dedicated nine-piece not only worked with a real string quartet (a premiere!) and granted Fabienne Erni’s sublime mastery of the harp the room it deserved; they also undertook a holistic upgrade resulting in some of the most catchy (‘Ambiramus’), most aggressive (‘Worship’, featuring Lamb of God titan Randy Blythe on guest vocals) or most epic (‘Black Water Down’) tunes the Swiss metal nobility has ever offered. Eluveitie have recently revealed the stunning new album cover artwork, created again by Travis Smith, as well as the album tracklist. “Ategnatos” is already available for pre-order in their label’s webshop in several formats and bundles.